As if it wasn’t hard enough to lose weight, along comes this relentless recession to make it even more challenging. Fattening foods are cheaper and easier to find than healthier fare. People are working longer hours for less pay, taking second jobs to make up lost earnings, and struggling to maintain a gym membership - or all three. Worrying about work translates into wider waistlines, it turns out, mostly for people who are already overweight. Oh, and losing sleep, too? That’ll add on the pounds, as well. While it’s giving a whole new meaning to the phrase “the weight of the recession,’’ it has also presented doctors and health officials with an opportunity to remind people that healthy choices can be made in boom times and in bad times. State and national health experts say it’s too soon to tell if the anemic economy is boosting obesity. But healthcare providers and exercise experts are seeing changes they tie to tighter times, for better or worse. Whether people turn to fast food because it’s what they can afford or skip exercise because they’re starved for time, the result can be unhealthy weight gain. For Jean Drew in Epsom, N.H., putting healthy food on the table for her family requires some ingenuity. Her daughter Rebecca, 10, is learning how to read nutrition labels in the grocery store to comply with prescriptions from a Children’s Hospital Boston program she attends to achieve a healthier weight. Drew scours supermarkets and farm stands for savings on the fruits, vegetables, chicken, and fish she knows are better than less expensive macaroni and cheese. But stretching the family food dollar got harder four months ago when Drew’s husband, Scott, a truck driver, had his hours cut. She now works two part-time jobs, as a graphic artist and in retail, to pick up the slack. To keep ahead of the food bill and teach Rebecca how food is grown, the family now picks raspberries at her grandparents’ patch, some of which they trade for vegetables grown in friends’ gardens. They also grow tomatoes and zucchini at her other grandmother’s house, where they also share meals to save money. “We’re all eating better,’’ Drew said. Better nutrition is the goal of the food pantry at Boston Medical Center, believed to be the only one of its kind in the country. Dr. Caroline Apovian sees the economy’s hand both in the hospital’s busy food pantry and in her weight management clinic at the hospital. From 400 people a month last year, the pantry’s patrons have soared to 7,000 per month this year. Many are obese, she said, owing to past reliance on cheap food high in fat and calories. In her clinic she sees other barriers to achieving a healthy weight. Prescription obesity drugs are not covered by insurance, but patients got help with the more than $100 a month price tag from pharmaceutical company coupons. When the economic downturn deepened last fall, drug makers pulled back some of their discount programs. At the same time, gym memberships are also moving out of reach for some of Apovian’s patients. “It’s all sort of drying up at once and the person who suffers the most is the one who is looking for the amenities to help them with weight loss,’’ she said. In response, the hospital and the Roxbury YMCA launched a pilot partnership last month to teach people at risk for diabetes better nutrition and encourage developing new exercise habits. But people who already have access to gyms don’t always get to use them. Job-related stress and weight gain are companions, according to a paper published last week by Dr. Jason P. Block of Brigham and Women’s Hospital. He and his Harvard colleagues found that stress on the job and trouble paying bills were the biggest risk factors for weight gain among men and women who were already overweight. For women, stress in relationships was also associated with weight gain, if they were above normal weight to begin with. 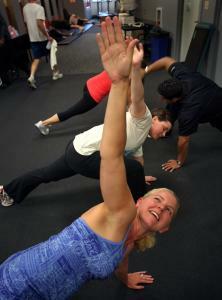 A fitness specialist suggests working out as a way to counteract work-related stress. A national survey conducted in the spring for the council found that current exercisers are not giving up on their routines, but many are finding more frugal ways to keep fit. In and around Boston, for example, people are switching from one-on-one sessions with personal trainers to small groups of four to eight people at one-third the price for each participant, said Sam Berry, director of personal training for Fitcorp. The company has 11 centers and also contracts with businesses to offer fitness benefits to their employees. Lisa Lawton, whose job and workouts are in the same building in Boston’s financial district, made the switch in January. “With the economic downturn, it’s definitely more affordable to do the group training versus the one-on-one,’’ she said. Vice president of human resources at AMR Research, Lawton said the company continues to provide discounted Fitcorp memberships to its employees, despite the recession. She wouldn’t trade the camaraderie she has found with the group, which she credits for more inches lost and fitness gained this year. Nor would she part with the payoff in her workday. Stress can take a toll on entire families already struggling, according to Dr. David Ludwig, director of the Optimal Weight for Life program at Children’s that Rebecca Drew belongs to. Amid the gloom, a Boston University nutrition professor sees an opportunity in the economic downturn. “To get the most bang for your buck, you’re now forced to rethink where your food dollars go,’’ said Joan Salge Blake, who is also an American Dietetic Association spokesperson. She recommends filling the shopping cart with fresh fruits and vegetables when they are in season or on sale, and heading to the frozen vegetables aisle otherwise. Meat, fish, or poultry should be in 3-ounce portions and whole grains should make up the rest of a well-balanced varied diet. Elizabeth Cooney can be reached at lizcooney@gmail.com.